Some 42 teams, consisting of four members each, have since entered, and now the NWU, Kovsies, Stellenbosch University, and the Universities of Cape Town and Pretoria will compete against each other to see who’s the fittest university of all. This challenge has been designed to get employees more physically active and ultimately to improve their health. Prof Hanlie Moss, research director of the NWU’s research focus area for Physical Activity, Sport and Recreation, accepted the challenge on behalf of the NWU, and accordingly invites all staff on all three campuses to participate. At the end of the eight-week challenge, the university with the most steps logged will be crowned as this year’s fittest walking/running university. BESTMED is the sponsor of the challenge and the winning teams of each university will receive four x R500 vouchers. Second prize winners from each university will receive four x R250 vouchers, and each participant will also receive a medal. 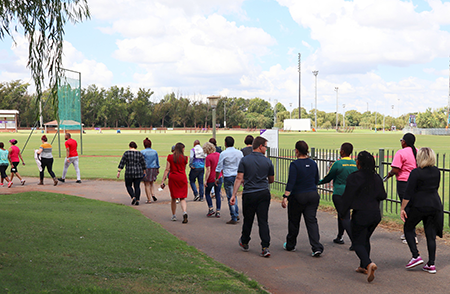 Right after the official launch, employees got the opportunity to log their first steps in this year’s challenge, and they enthousiastically made their way along the campus trail. Good news – you can still enter! During the launch, organisers announced that the challenge is still open to participants who whishes to enter. • A team consists of four employees. A team captain is chosen by the members. • The role of a team captain is to motivate their teams weekly and log the distance of the team members. • A link will be provided to log the team’s total kilometres. • Every participant record the number of steps/km taken daily at their own time (monitored by own pedometer or app on phone). • Weekly totals are submitted to the team captain, who will submit the team’s distance on the log provided by the challenge coordinator, Arina Engelbrecht. For any enquiries, please contact Prof Hanlie Moss at hanlie.moss@nwu.ac.za. *Last year, the NWU entered 30 teams to compete against Kovsies’ 60 teams. Between the two universities, approximately 132 000 km were logged over 10 weeks.